Wow! I was blown away by the response to a proposed ready-to-wear tailoring sewalong – at almost 50 confirmed participants and lots of “maybe’s”, I think we have enough of us to make it official! Every sewalong needs a badge, right? So here’s a pretty picture to copy and paste into your blog sidebar, and if you’re clever you can link it directly to the new RTW Tailoring Sewalong page above, which will eventually have links to all the sewalong posts in one convenient place. You’ll notice I’ve made a list of all participants in the sidebar too – please let me know if I have made any mistakes here, it is highly likely as I had several interruptions while doing this! And it’s not too late to join up – just confirm you will sewalong by commenting on this post. We start on 1 April, and I expect the sewalong to take about a month. And don’t worry if you’re not quite ready by our start date – the posts will stay where they are, so you can check back at any stage. Just a quick reminder that we will be following fusible tailoring techniques, just like the construction methods used in women’s ready-to-wear jackets today. I won’t be covering hand-tailoring techniques in this sewalong, however you are free to follow along and adopt any techniques you choose. Fusible and hand tailored methods often overlap – designers will adopt a mixture of either technique as they see appropriate. 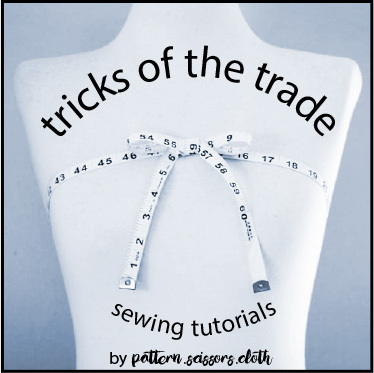 But unless you have a few jackets under your belt I would encourage you to follow the method in the sewalong, as we are going to do some pattern amendments before we cut our cloth and I don’t want to be the cause of any expensive mistakes! Q Is there a tried and true pattern you’d recommend? A Actually I’m totally unfamiliar with the commercial patterns available so can’t recommend any particular one! But any women’s jacket with a collar and lapel, jet/welt/flap pockets, and a one or two-piece set in sleeve, will do – see the next question too. Q a) Would Burdastyle #109/2/11 work? b) Is Vogue 8333 a suitable pattern for your sewalong? c) Would Vogue 1037 be suitable? A a) Yes. b) Yes, perfect! c) Vogue 1037 has raglan sleeves and a roll collar so will have a different construction method to what we will use in the sewalong. Q Will we need an overlocker/serger, or will just a sewing machine do? A You’ll just need a sewing machine – all seams will be totally enclosed so overlocking won’t be necessary. Q Would a spring jacket work? In tweed? A I think so – your fabric choice will depend on your climate. Q Do you use fusible Hymo and know any good sources? A Is that fusible canvas? If so, no I don’t use that. I generally use soft flexible fusibles and will cover that in my next post, as I know many of you will need to source some soon! Q Have you started the Flickr group yet? That’s it for now – so grab your RTW tailoring sewalong badge, and watch out for an important post on fusing in the next couple of days! And by the way, thanks so much to Carolyn for the Awesome Blog award, and also to AnaJan and CreativeMama for the Versatile Blogger award – I really appreciate your wonderful blogs too! Who wants to do a Tailoring Sewalong? Yes, I posted about it linked the badge to the SAL page. wow what a lot of work you have done, and not sewn a stich yet on a jacket! I know it takes time to do all those links, etc. I better get going on some fabric and inspiration. 8. Save and it's done! Sherry, I just posted instructions on my blog about adding a code to a badge, to make it easy for your readers to display it on their blogs (http://frabjous-fashion.blogspot.com). Sorry, no intentions to promote my blog. I tried to post the code here, but comments would not accept html. Feel free to delete this comment once you read it – I would have preferred to send it as a private message anyway. And thanks for adding me to the list, I am really looking forward to this one! Oh thanks so much Marina – I wondered how to do that! You're a star, and I will update my rather long-winded method! I am a huge fan of your blog. I first found you by searching for suits on burdastyle. I just bought a vintage suit pattern on etsy from 1942. I learned a lot from my previous suit, but feel like there are certain things that I could get some help with. This will be a great and perfect timing tutorial. I also just started a new wordpress site on my website. Your link was the first one that I added. I enjoyed learning how to do this and look forward to the sew along! I may have babbled too much in my previous comment. It may have been unclear, but I am interested in joining this sewalong. I have never done one before and look forward to it. ~kate – although this one has a collar and lapel, it also has a raglan sleeve so the the construction method will vary to the sewalong. Are you able to find a pattern with a set-in sleeve? -Rebecca – sorry I'm just a bit late updating new participants! I want to join. It is always fun to learn new techniques. ~Anonymous – yes you can, several participants do not have blogs. But a blog is a great way to share and write about what you are making, and I can link to it in my sidebar so others can find you! I have also set up a Flickr group where you can post photos and comments, click on the RTW Tailoring Sewalong tab above for the link. Thanks for the effort to share your knowledge with us.you shown a very good interest to make a analysation about tailoring industry.